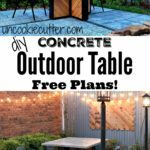 Outdoor Concrete Table Tutorial – All the Details! Hello and welcome back! 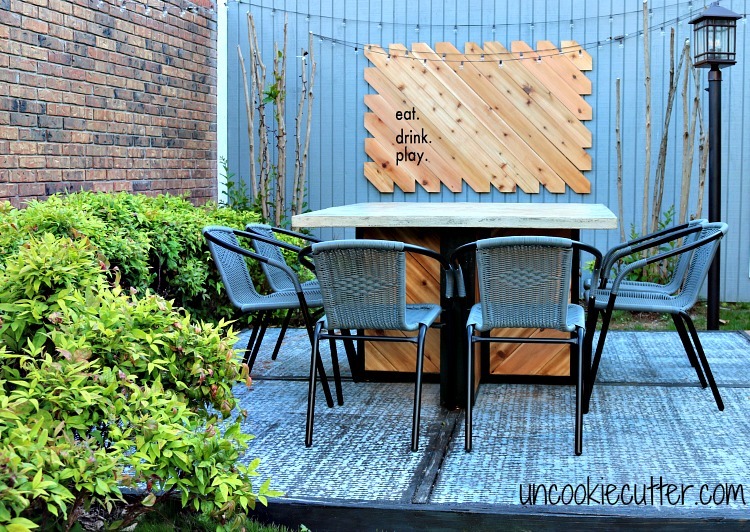 Last week I shared our courtyard makeover and we are LOVING it. We have been having dinner out here every night. One of the things I love most about it is our new outdoor concrete table. 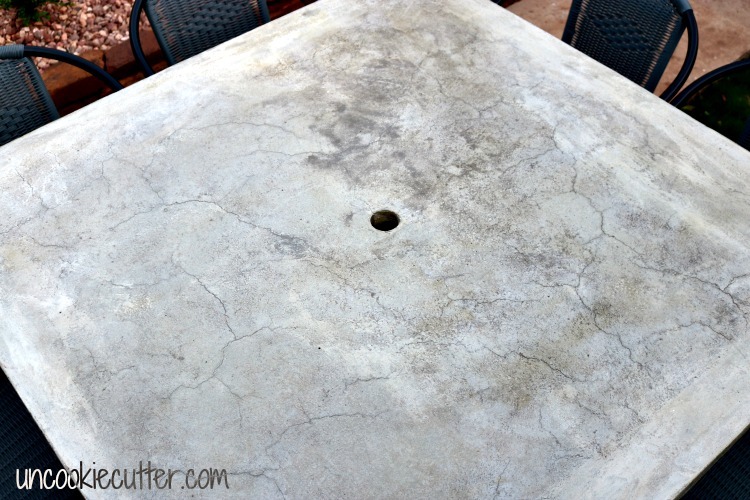 This is my 3rd concrete top table and I couldn’t love this one any more than I do. It’s my favorite so far, but in all honesty they are all my favorite until I build the next one. This one had some different stuff going on that I will discuss in detail. This post contains affiliate links. See my full disclosure policy HERE. So, have you guys heard of my friend Adam over at Lazy Guy DIY? He’s says he’s lazy…but I’m not buying it. You should see some of his furniture. It’s amazing…and his blog is hilarious. Any who, I wanted a table but just couldn’t come up with a design I liked by myself and couldn’t find any plans that fit with the feel I was going for in the space. So, I begged asked him if he wanted to team up and design a base for me to build. He agreed and of course, his design was perfect. 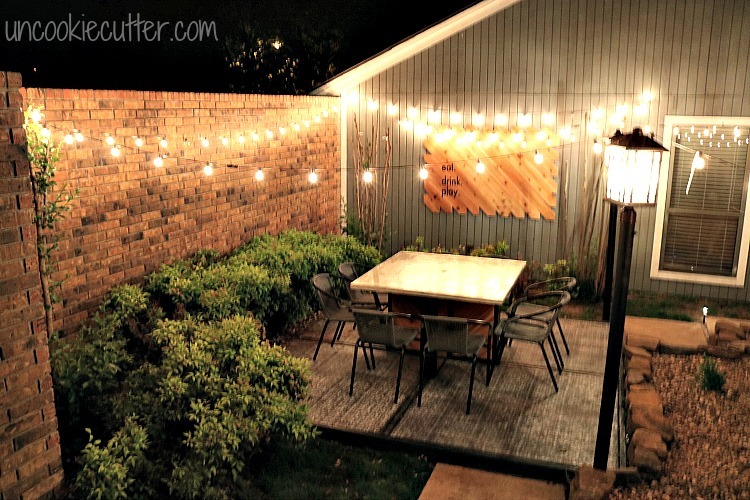 I wanted a square table for this space, mainly because the patio is…well, square. Plus, I like squares. Something about circles and ovals that throws me off. I like squares and rectangles. Anyway, you’ll have to head over to see Adam HERE to get the plans, but I’ll walk you through my notes here as well as how to make the top. 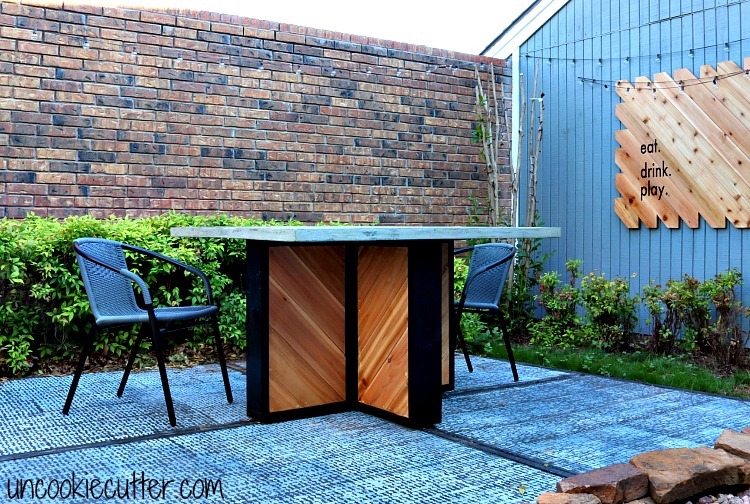 So, let’s make a outdoor concrete table….I started with a bunch of wood. Surprised? 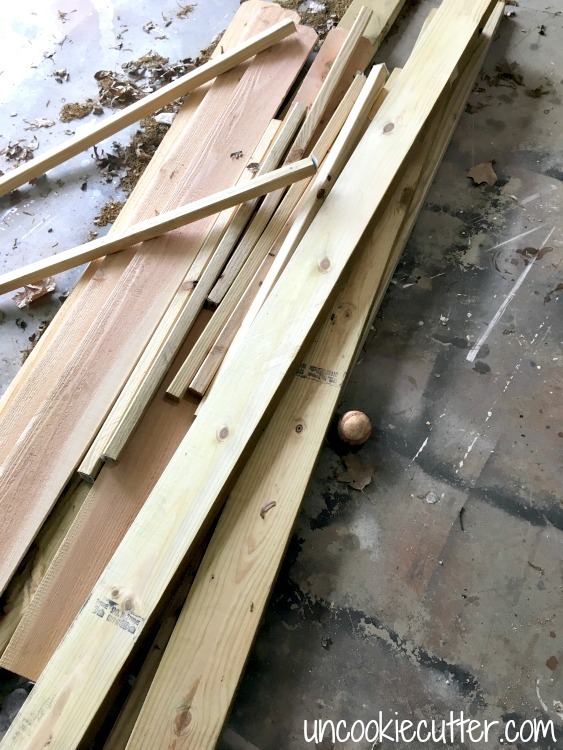 The first thing I did was cut all the boards to the sizes I would need (except the cedar) and then I ran everything through my planer. This step isn’t necessary, it’ll just save you so much time sanding later. I love my planer. Love it. Love. Next, I assembled the base following the plans. 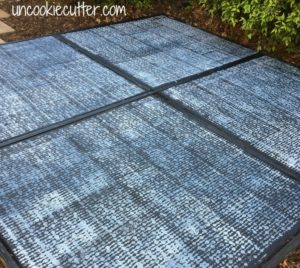 Once I had all these pieces assembled, I stained it with Polyshades by Minwax in Classic Black Gloss. Then I added the cedar fences pieces, cutting them as I went. I ran these through my planer as well. 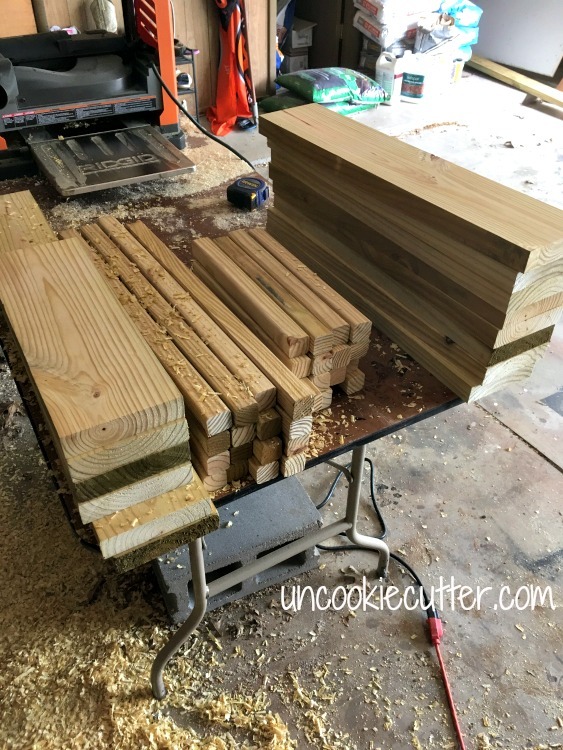 Did I tell you I love my planer? I cut each piece to fit, and after they were all attached I stained them with Polyshades in Classic Oak. Look how PRETTY THAT PLANED CEDAR IS! Sorry. Now for the top. 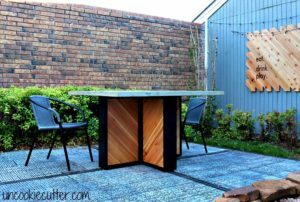 I’ve built 3 concrete tables now and one countertop. It’s may favorite medium to work with. It’s durable and easy to clean and strong as all get out. To start, you’ll want to build a form for the concrete. Mine is 49″x49″. I use melamine-lined plywood for concrete forms, because it doesn’t stick to the concrete. I cut the base piece to size and then added the sides to hold the concrete. 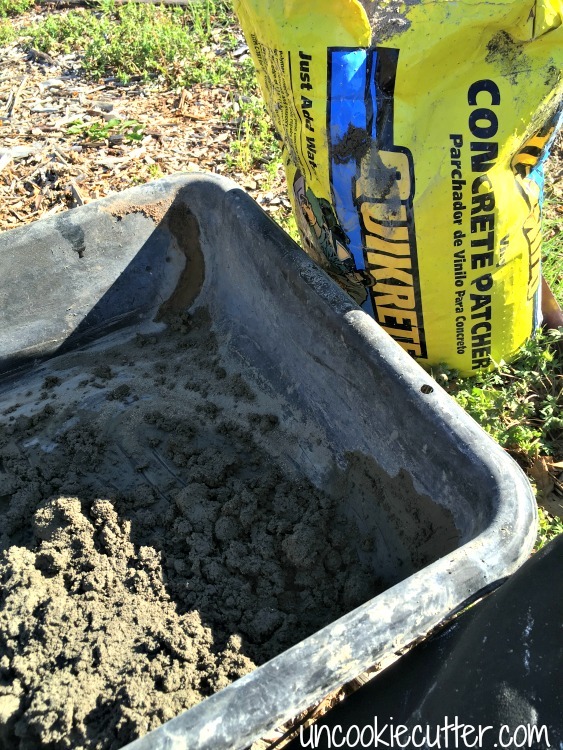 For the type of concrete I used, I wanted to make sure it’s at least 1 3/4″ thick. I also wanted a spot for an umbrella, in case we decide to get one later. 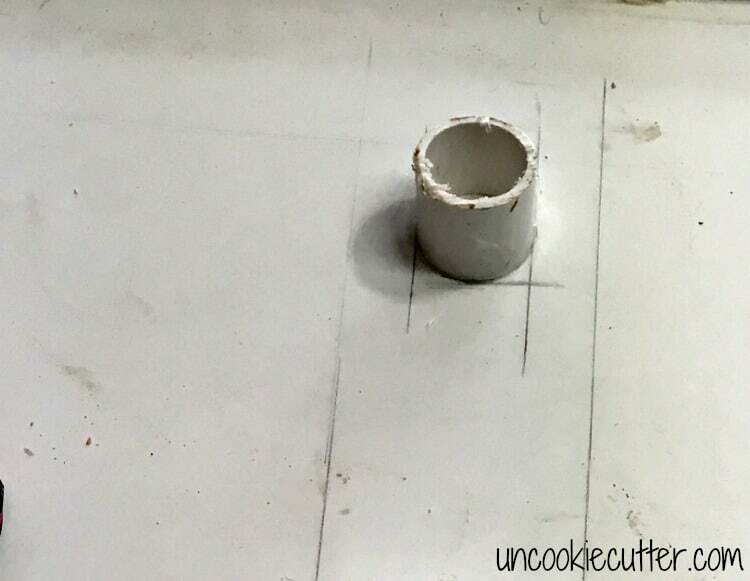 I used a 2″ PVC pipe and cut it down to the thickness of the slab – 1 3/4″. 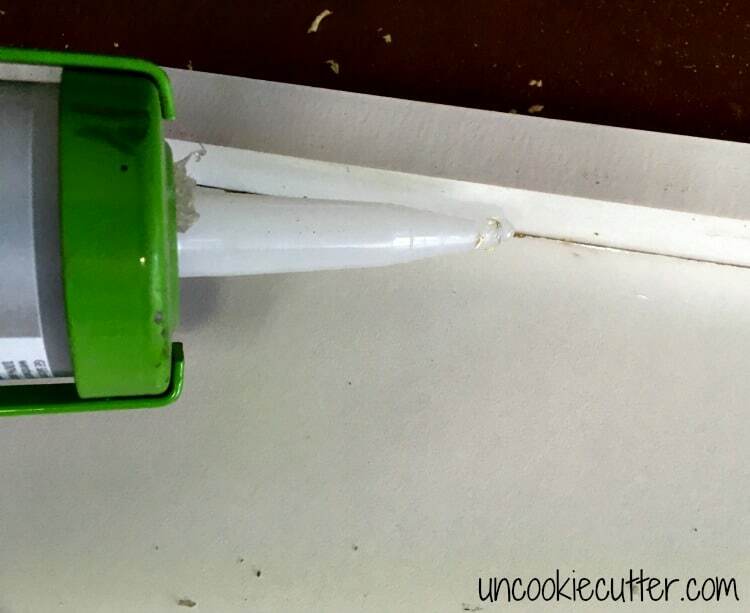 Once I have everything in place, I seal all the cracks with 100% silicon waterproof clear caulk. Now it’s time to pour the concrete. I have found it’s easier to put the form right on top of the base and pour it in place. Just make sure to cover the floors and base of the table, cause this is going to get messy! I have recently discovered Quikrete’s countertop and table mix and this stuff is legit. I love it. We mixed it up and poured it in. Make sure you use rebar and wire mesh in the form. 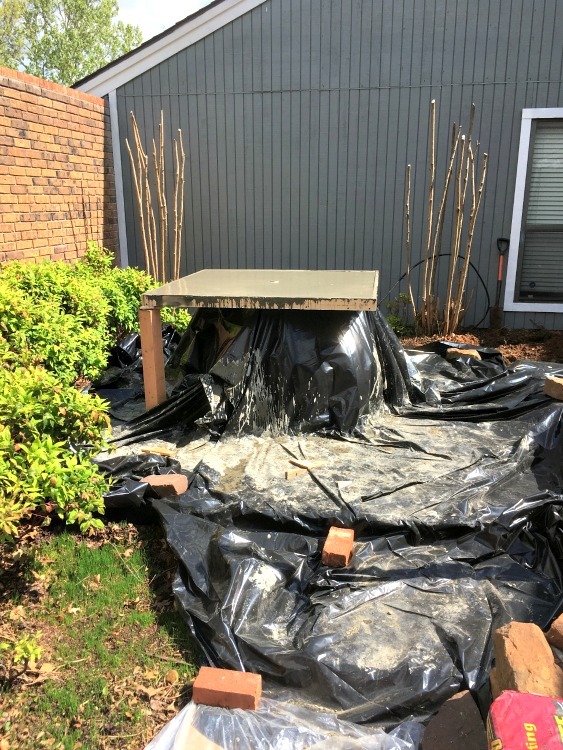 You can place it in before you start adding the concrete or after the very first layer, but you’ll want to put it in pretty quickly after starting. 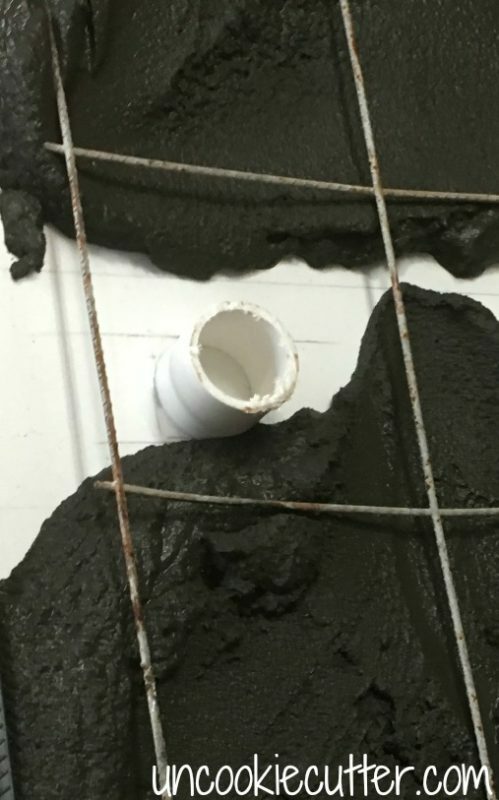 The rebar and mesh really help make the concrete super strong. Sorry I didn’t take a ton of pictures, since we were working outside, we had to work super fast. Once you add all the concrete, smooth it out with a trowel. 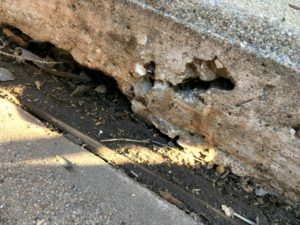 Take a hammer and hit it many, many times along the sides and underneath to release all the air bubbles and to allow the concrete to work itself down into any unfilled spots. If the weight of the concrete weighs any of your corners or other spots down to where it’s uneven, you can put a support like I did in the left corner. Make sure it’s level before it starts to dry. Now, here is the part where I almost lost it. After we had let it sit for a few hours, the top cracked. 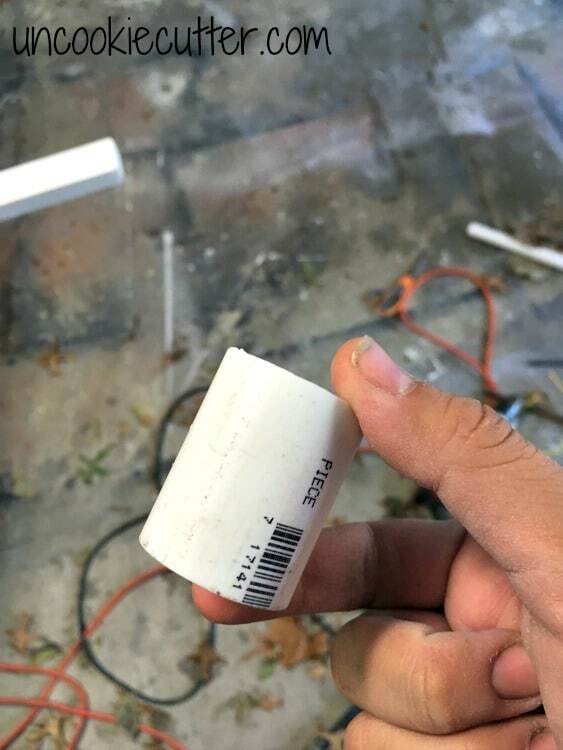 I, at first, thought it was ruined, but after inspecting it and talking to my Quikrete rep, I realized this was going to be okay. Actually, it turned out really really cool. I think what happened was, there was too much water in the top layer. I did wonder if it was too much water at the time, but let it ride since it was hot out and starting to dry. If this happens, don’t worry – all is not lost. 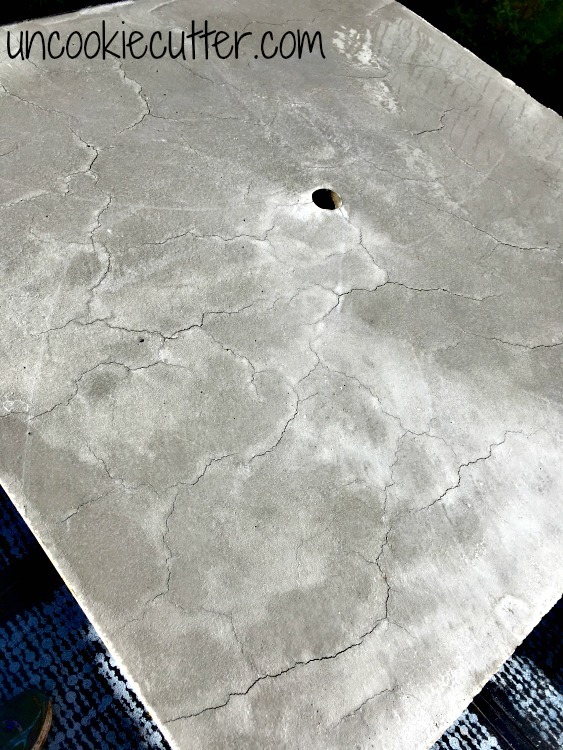 I used Quikrete vinyl concrete patcher to fill the cracks. It was super easy. I only mixed up a small amount and then filled the cracks. It worked like a charm. Now, let it dry. For days – at least a week or so. Then you can unscrew the sides and pull the form off. 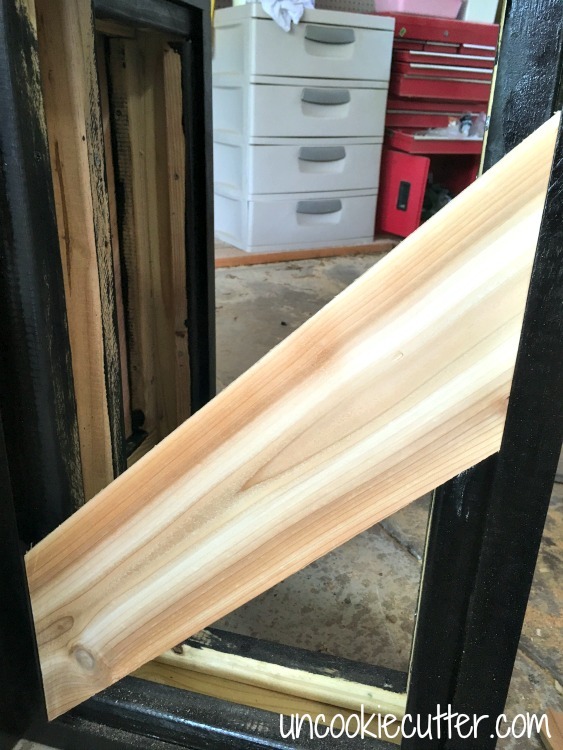 You’ll have to get the bottom piece off as well, but trust me this is easier than getting the bottom off somewhere else and trying to move a concrete slab. They can weight A LOT. 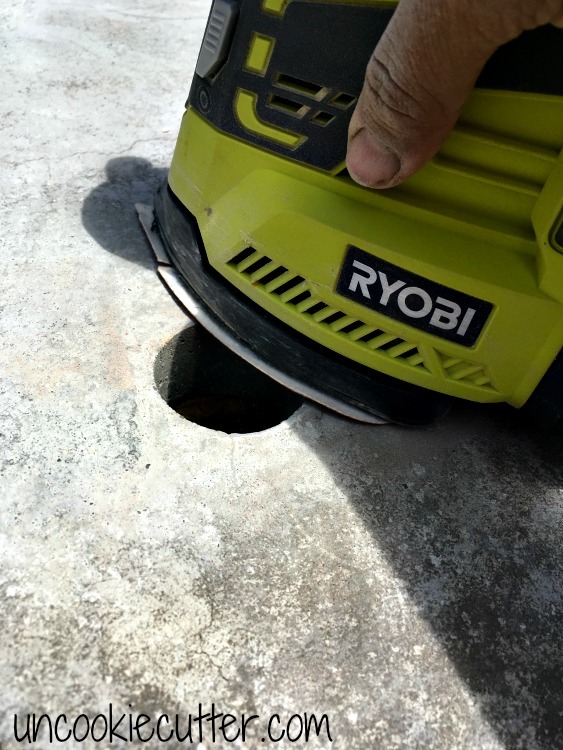 Next, fill any holes that didn’t settle out (more info HERE) and once THAT is dry, sand sand sand until it’s as smooth as you like. 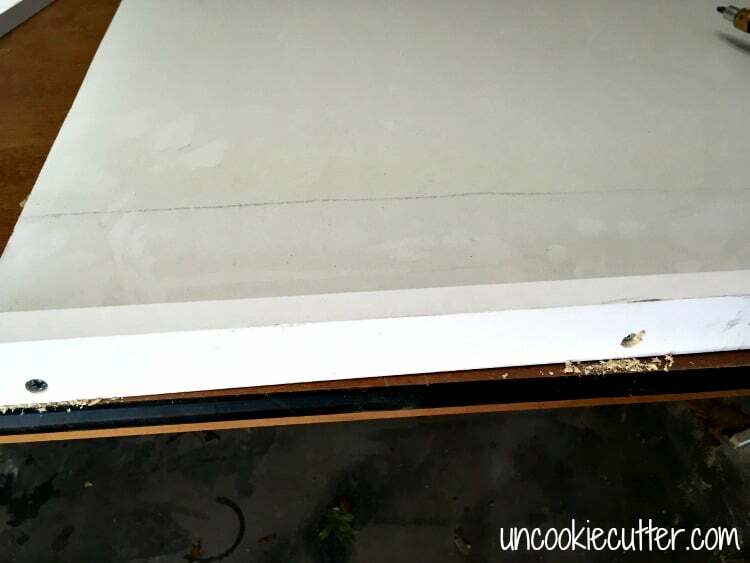 You can spray the table with water to help prevent chipping while you sand. After the sanding is done and the table is all ready, it’s time to use some Poly to finish it off. I used Helmsman Spar Urethane because it is made for both indoor and outdoor use. Didn’t that top turn out so cool looking?? 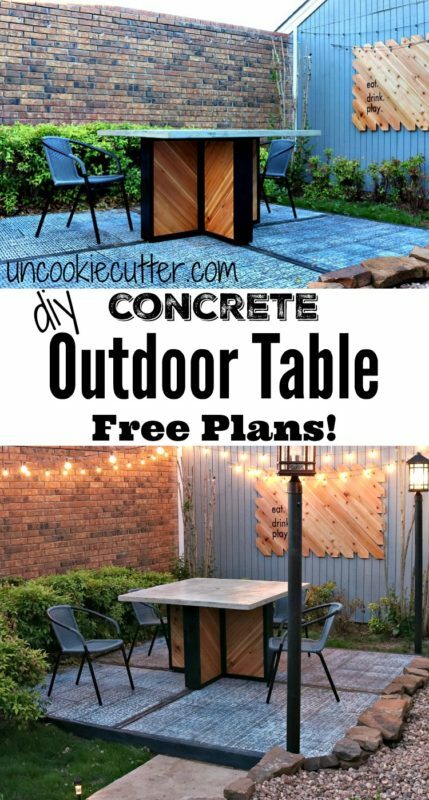 That’s about it for my outdoor concrete table. You can add an umbrella if you want. 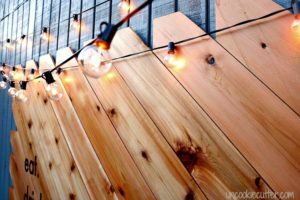 Check out the other projects featured in this post! Remember to head over and get the plans for the base HERE. Thanks for stopping by! Let me know if you have any questions. 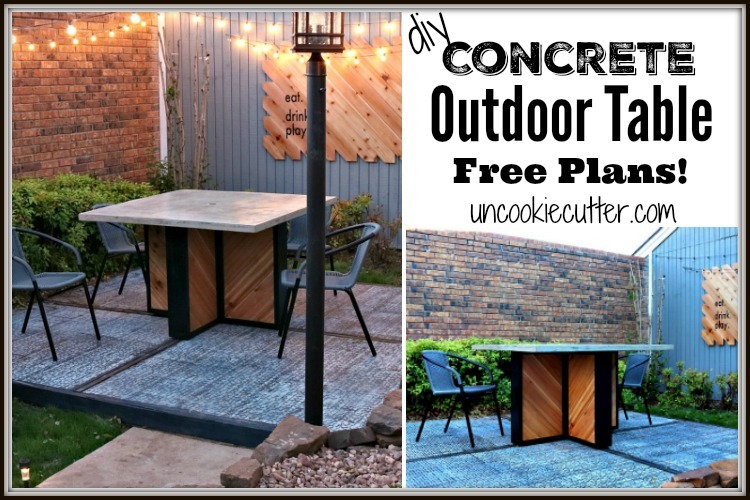 All your concrete posts really want me to go start working with concrete again (we’ve done a sidewalk before, but I’m really thinking a tabletop might be might next project 🙂 !) Looks great! Just do it! 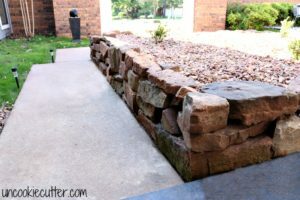 Concrete is so affordable, if you mess it up it’s no big deal :). This turned out amazing, April!!!! 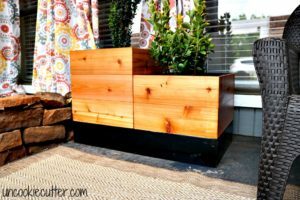 I am so impressed by your building skills – all of your furniture turns out fantastic! Listen Here to Our Weekly Podcast! Hi, I'm April. 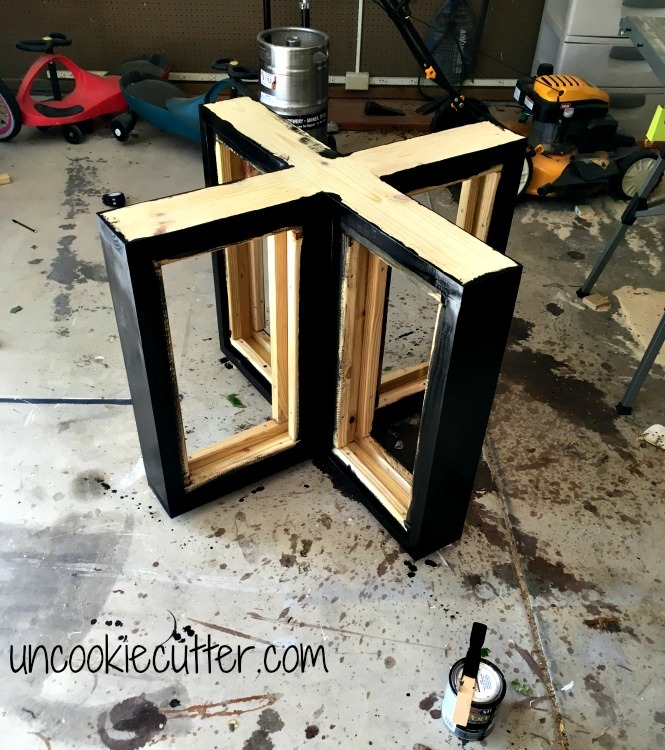 I'm so glad you've found your way here to Uncookie Cutter. We are in the process of living in our fixer upper. Find out more about me here. Hey there, before you go...Sign up for our FREE newsletter so you don't miss a single project! Tell me where you want all the updates sent.